I pulled a plateful of baby carrots yesterday. These are a mix of Red Core Chantenay, Oxheart (the fat ones) and Cosmic Purple that I planted on April 25. Tiny but tasty! I tagged you with the Seven Random Garden Things About Me Meme. The rules are on my blog. I've been thinking about carrots. 54 days seems a lot better than what I've got. Maybe I'll make a little space next to the spuds and try some different seeds. Those carrots are adorable. I planted carrots once and they were extremely tiny but they were the sweetest I ever tasted! Lovely carrots and lettuce. I planted carrot seed twice, but never got any. Alas my "lettuces" are arugula, mustard, radish etc. all which grow really here, as normal lettuce will shrivel most of the year. We have been enjoying lots of salad at dinner! Such sweet looking little carrots! I had seed to plant these this year, but didn't get it sowed, so will try for a fall crop. Those are pretty cool they look like Japanese cartoon versions of carrots. Even the tiny littlest ones, I clean and arrange nicely because they taste incredibly good. Sweet and very carroty. 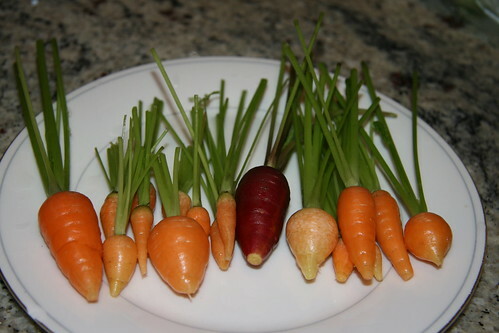 I just love my garden carrots!